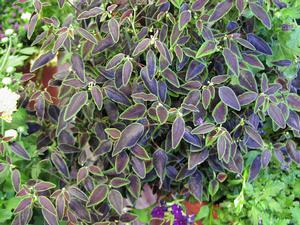 Small delicate deep burgundy leaves with a green margin cascade and become dense as the plant becomes larger. A brilliant accent foliage plant that intermixes with other plants beside standing as a very unique specimen all on it's own. As with all Euphorbia a bit of caution should be taken because of it's toxicity.